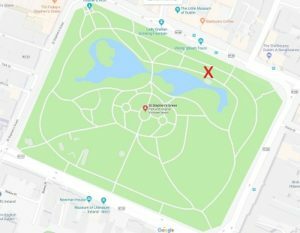 The College of Psychiatrists of Ireland will hold its 4th annual event in support of Green Ribbon month in St Stephen’s Green (by the Gazebo) on Thursday the 31st May. When it comes to mental health difficulties everyone has a story to share and we find comfort, empathy and compassion in shared experiences. 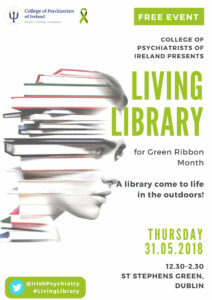 Social contact is known to be one of the most effective ways of reducing mental health related stigma and discrimination so with this in mind, and to mark Green Ribbon month, the College is delighted to announce our ‘Living Library’ event, a library come to life in the outdoors! At our library the ‘books’ are a little different, they are people; people with different experiences and stories to tell related to mental health including those who have experienced mental health issues and illness, their family members and carers, and the psychiatrists who work with them towards the path of recovery. Mental health stigma too often creates discrimination and misunderstanding so we want to give members of the public the opportunity to connect and engage with psychiatrists and people they may not normally have the occasion to speak to with. The aim is to better understand the lived experiences of others who have experienced or facilitated recovery from mental illness and distress and to challenge their own assumptions, prejudices and stereotypes. We invite you to ‘read’ the human books – through conversation and gain understanding of their experiences. Dr Miriam Kennedy, Consultant Psychiatrist (General Adult and Later Life), ‘Depression: Drugs or No Drugs?’. Mr Rick Rossiter, REFOCUS (Recovery Experience Forum Of Carers and Users of Services) Committee member, ‘A Father’s Confession’. Dr Aileen Murtagh, Consultant Psychiatrist (Child and Adolescent), ‘Behind the Diagnosis’. Dr Thekiso B. Thekiso, Consultant Liaison Psychiatrist/Psychological Medicine and Senior Clinical Lecturer, ‘A Double Edged Sword’. Dr Sarah O Dwyer, Consultant Psychiatrist (General Adult and Old Age), ‘Brain Health and Successful Ageing’. Dr Seamus Mac Suibhne, Consultant Psychiatrist (General Adult), ‘Listening to Stories in a Digital Age’.